We are surrounded by water - in the sea, in rivers and lakes, underground, in living things and in the air. This water is constantly moving from one water source to another. As it moves, it may change from liquid water into a solid (ice or snow) or a vapour, or back again.Let us begin with the oceans and large water bodies. Their large surface areas absorb the sun's energy (heat), warming their surfaces. As the water heats up, it evaporates (turns from liquid to vapor). Rising air currents, resulting from unequal air pressure, lifts the vapor high up into the atmosphere.Up there, cooler temperatures cause the vapor to condense (vapor turning back into liquid). Winds and air masses move the moisture around a bit, forming clouds. With time, they become heavier with water. This develops into rain-bearing clouds.The water now falls from the sky in the form of rain, snow, sleet and hail.This is what the Science tells us about rain.But the same scientific fact is mentioned in ancient Tamil religious literature too. There is a verse in the Thiruvembavai [Poem 16:"முன்னிக்கடலை சுருக்கி எழுந்துடையாள்"] as below, which talks of how sea water evaporates and makes clouds heavy with moisture. The Thiruvempaavai, a collection of twenty hymns in which Manikkavacakar has imagined himself as a woman following the Paavai Nonbu and praising Shiva. Is it not our Lady." Here there is a subtle comparison between sivan,sakthi,and a cloud that in the monsoon season rises from the sea.The cloud drinks the waters of the sea, gleams in the sky with lightning fires, sends forth the voice of the thunder, is sometimes made beautiful with a rainbow, and then spreading itself over the heavens,pours down fertilizing showers on all the earth below. 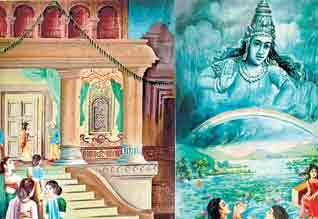 So sivan drank the poison of the sea; dances in sithambaram while His golden anklets sound;wears a form of dazzling splendour; is renowned for the victories He gained with His bow; and pours forth blessings over all the earth. The comparison of Uma or sakthi is obvious. In this stanza which is important is the line ’மீனடைந் தோடும் விடுசுட ரான்கதிர் வீழ்புயன்மேற்’. Let us see the meaning of the phrase of this line. வானிடு வில் = வானவில் = Rainbow சுடரான் = சுடரோன் = Sun. கதிர் = Rays of Sun வீழ்புயன்மேற் = நீர் மேகத்திற் மேல் = over the clouds containing water particles.In translation, it states that a Rainbow is formed when the rays of the sunlight shines over the clouds (நீர்மேகம்) which contain water particles. This is an accepted theory of modern physics.A rainbow is an optical and meteorological phenomenon that causes a spectrum of light to appear in the sky when the Sun shines onto droplets of moisture in the Earth's atmosphere. They take the form of a multicolored arc, with red on the outer part of the arch and violet on the inner section of the arch.From the above it is clearly evident that, at least during the 4th CE, Tamils were aware of the scientific reasons for the formation of a rainbow. This might be the first written evidence available to us since the modern age.